FROM starting prayer groups to cheering at the mention of his name, people around the world continue to show their love for Pope John Paul II. A year after Pope John Paul’s death, the Vatican still maintains a separate entrance to the grotto under St Peter’s Basilica where he is buried, and Pope Benedict XVI still cites his writings and example in his public speeches. While the cause for Pope John Paul’s canonisation continues with interviews of people in Rome and Poland who were close to him, Pope John Paul prayer groups are springing up around the world. 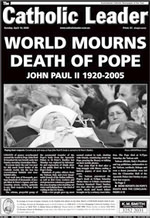 Msgr Slawomir Oder, the official promoter of the pope’s sainthood cause, said the groups – one in Argentina calls itself “Juan Pablo Magno” (John Paul the Great) – not only support the cause with their prayers, but they study Pope John Paul’s writings. Pope Benedict does not appear jealous of the attention. In fact, from the beginning of his pontificate he has urged the Church to continue to study the teachings of his predecessor. Speaking to the Roman Curia in December, he said: “No pope has left us a quantity of texts equal to what he left us. No pope before him could visit the entire world like he did and speak directly to men and women of every continent. “The Holy Father, with his words and his works, has given us great things; but no less important is the lesson he gave us from the chair of suffering and silence,” Pope Benedict said. In addition to the TV movies, documentaries and books on the life of Pope John Paul, a new Italian work focuses specifically on the suffering. Let Me Go: The Strength in Weakness of John Paul II was released on March 15 in Italy and features reflections by the pope’s longtime secretary, Cardinal Stanislaw Dziwisz of Krakow, Poland, and by Dr Renato Buzzonetti, the pope’s personal physician. Dr Buzzonetti, who was the pope’s physician for almost 27 years, wrote that the pope “was a person very attentive to noticing symptoms, which he described with great exactness, evidently with the aim of simply enlightening his doctor and accelerating his treatment so he could get back to work”. The title of the book comes from the pope’s last words, murmured in Polish: “Let me go to the house of the Father”. In his contribution to the book, Cardinal Dziwisz said Pope John Paul’s life “from the beginning was marked by suffering, which he transformed into an instrument for his apostolate”. The cardinal, who is now Archbishop of Krakow, said Pope John Paul’s obvious suffering in silence and his death were his “last catechesis”, telling the world that “moments of suffering and death must be lived in the light of faith, with love and Christian hope, in complete abandonment to the will of God”. The way Pope John Paul lived and the way he died have led millions of people to his tomb. Archbishop Angelo Comastri, the papal vicar for Vatican City State, said that until Pope John Paul died an average of 300 people a day went down to the grotto below St Peter’s to visit the tombs of the popes. Now, he said in early March, the daily number is 10 times greater and often reaches 20,000 on Sundays and holidays. Pope Benedict, one of Pope John Paul’s closest aides as prefect of the Congregation for the Doctrine of the Faith, obviously tries to connect with those devoted to his predecessor. At the beginning of his pontificate, Pope Benedict seemed surprised when people would interrupt him – especially during a Mass homily – with applause and cheers. When he would mention Pope John Paul, the reaction was immediate and predictable, and it did not take long for Pope Benedict to adjust his timing and, especially with young people, to emphasise his predecessor’s name and let the crowds roar.